​The new STI Black Diamond delivers crossover performance at a value price! Its innovative "V" tread pattern bridges the break between soft mud/snow/sand and hardpack surface performance. With its extended-wear tread compound, the Black Diamond retains its biting edges longer and greatly increases its tire life. 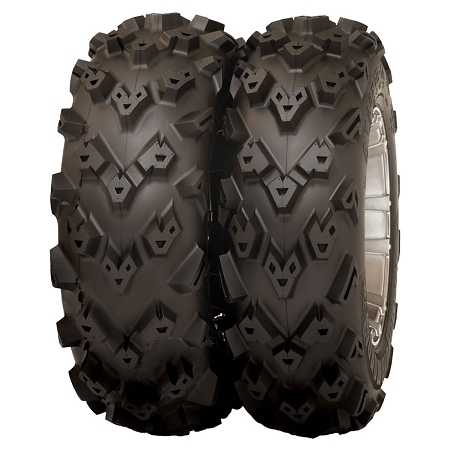 It is specifically developed 6-ply radial carcass for all seasons delivers the stability needed for UTV applications, while retaining the plush ride characteristic favored by ATV riders. Radial construction means the STI Black Diamond Radial rides smooth and finds more traction than a bias-ply tire because of a larger contact patch. A radial tire's footprint actually grows under load! Its simply a tire you can take off road, but yet will ride nicely on the trails! Radial construction means the Black Diamond rides smoothly and finds more traction than a bias-ply tire because of a larger contact patch. Pretty good tire. Cleans out well as long as you have a little bit of water. Very solid and rugged tire. The only downside I've found is that they are heavy tires. I wouldn't recommend them for vehicles less than 500cc stock engines.